It finally happened, after nearly sixteen years of daily driving, I hit a deer. I was on my way to an evening meeting at the church and it jumped from the side and square in to the passenger side of my car. I was not hurt, neither was the deer, but the fender on the other hand was a different story. It was two weeks before Christmas and I found myself dealing with my insurance company, cleaning fur out of my broken headlight, and getting a rental car. Here’s the thing, I wasn’t speeding, I wasn’t texting, I wasn’t distracted. I was doing everything right and that deer still found my car. 3,700 dollars and a rental car later I still can’t believe it happened. I want to find blame. I want to be angry at someone, even if it is me, but I can’t find anywhere to place blame. Sometimes these things just happen. Sometimes, things just go wrong. Without reason or explanation. Sometimes it isn’t a conspiracy or someone out to get us. It just goes wrong. What do we do with that? When it all goes wrong, for no reason, what do we do? It is easy to throw our hands up and pass the blame on to someone else, but what if it isn’t their fault? What if it isn’t our fault? It almost seems trite to quote bible verses when everything is going wrong but I wonder if that shouldn’t be our starting place? Especially when the things that go wrong don’t have obvious answers. 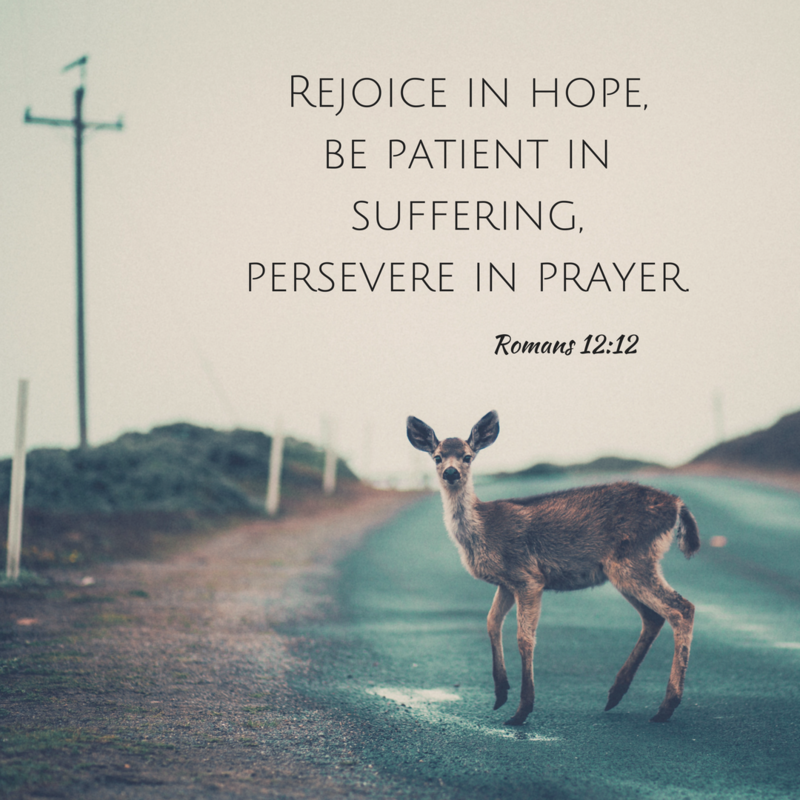 Romans 12:12 calls us to, “rejoice in hope, be patient in suffering, and constant in prayer.” Once we realize there is no one to blame, no divine conspiracy, no one out to get us, this is where we turn. We can rejoice in the hope that the car isn’t totaled and no one else was involved. We work on our patience. Patience towards insurance companies, adjustors, rental car businesses, and all the places that work so hard to make us impatient. We can be constantly in prayer for a quick turnaround and thankful that no one was injured. I think that this verse not only applies now, to me hitting a deer, but also when the bill is larger than expected, or the kids are misbehaving, or the boss is never satisfied, or the doctors have no answers. Whatever it is we can rejoice in hope, be patient in suffering, and constant in prayer.